THE 2017 An Post Rás has begun and is rolling. Amazing atmosphere in Dublin Castle this morning where there was a mix of nerves, pride, excitement and slick continental bike racers on show! A typical day in the Rás is always atypical and James Quinn found out quickly when he was caught up behind a crash in Leixlip. The bunch were certainly travelling at this point (almost 48km covered in hour one) so a mammoth chase for 30km followed. Not the kind of effort you need when you still have the majority of the day to go! James regained contact with the bunch, which is a win in the race within the race, Ronan Killeen, Niall Dwyer and John O’Regan finished just ahead of James at the line, with Adam Greally finishing in the main bunch and now standing at 16 seconds on GC. Manager Justin and mechanic Lawrence were close on hand with support all day. 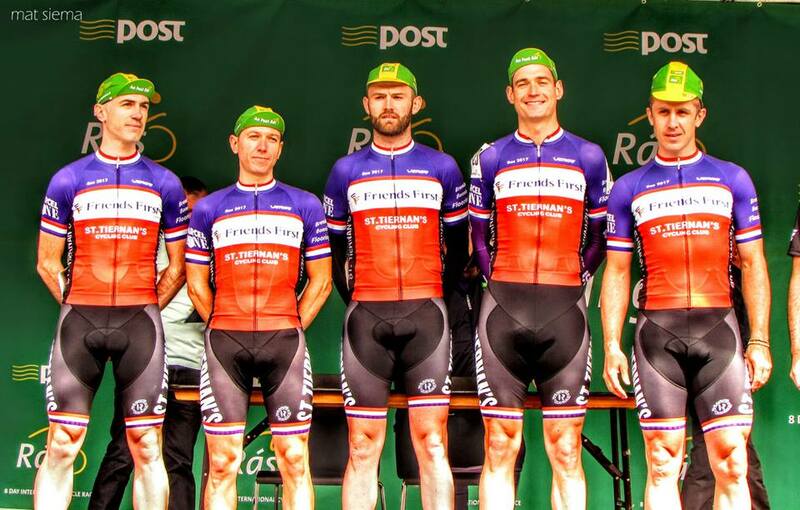 Swanny Amanda has the guys recovering as best they can for tomorrow when it is off to the West to the finish in Newport – hopefully not too wild on the Atlantic way. Everyone is happy to be in in one piece as after so much preparation work it can come undone in an instant when unlucky. Let’s hope for more of the same tomorrow. No Replies to "Ras 2017: Stage One - Crash holds up Quinn, as Greally features in GC"